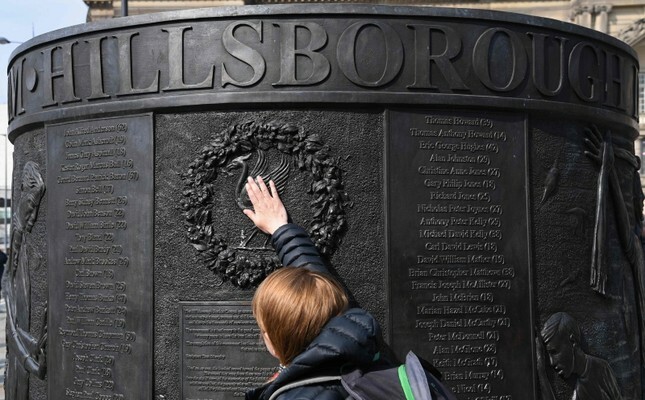 The English city of Liverpool fell silent on Monday to mark the 30th anniversary of the Hillsborough football stadium disaster, which claimed the lives of 96 Reds supporters. Mourners lit a lantern for each of the fans who were crushed to death at the FA Cup semi-final held at the stadium in Sheffield on April 15, 1989. Banners spelling out the letters "never forgotten" were hung from the city's St George's Hall, above the lanterns, flowers and pictures of the victims. "The support this city, and the people of Liverpool have shown us, all of us families has been tremendous," said Louise Brookes, whose brother Andrew died in the disaster. "They've never let us down. They've never failed us. They continue to support us." Liverpool mayor Joe Anderson, who laid a wreath on behalf of the people of the city, said it was "a day for the people to remember and support the families. "For 30 years the city is united behind their families and gave them as much support as they possibly could do, emotionally and standing shoulder to shoulder with them. That's all we can do." The city fell silent at 3.06pm (1406 GMT), the time the match between Liverpool and Nottingham Forest was stopped, in honour of the victims, while flags on civil buildings were flown at half mast. Fans also placed flowers and balloons at the memorial at Liverpool's Anfield Stadium. The police commander at the disaster faces a retrial after a jury earlier this month failed to reach a verdict over his role in the deaths. Dozens of relatives of the victims who had gathered in Liverpool -- 25 miles (40 kilometres) away -- gasped as the jury foreman told the court they could not reach a unanimous decision on charges of gross negligence manslaughter against retired chief superintendent David Duckenfield. The crush was Britain's worst sports stadium tragedy.